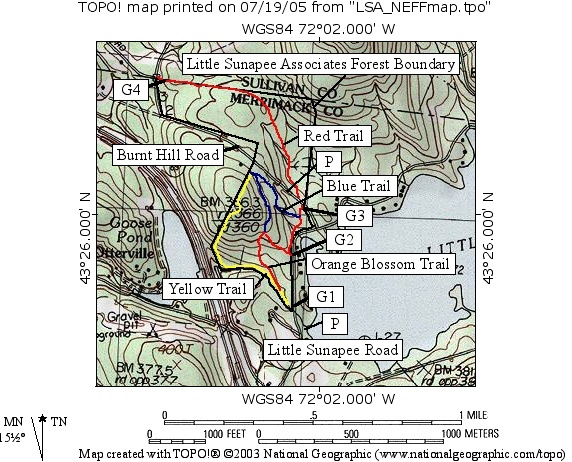 The four trails in the Little Sunapee Associates Forest are color coded: Red, Blue, Yellow and Orange (the Orange Blossom Trail). Parking is available along the sides of Burnt Hill Road and at the state boat launch on Little Sunapee Road. The Yellow Trail starts at Gate (G1) on Little Sunapee Road then follows along the brook flowing from Little Sunapee Lake to Goose Hole Pond. The trail turns right at the edge of the I 89 right-of-way and proceeds along the fence marking the right-of-way to a sharp right turn at a property bound (bounds are marked in red), ascends along the boundary, crests the hill, and descends to an intersection with the Blue Trail. The Blue Trail can be followed to the right and back to an intersection with the Orange Blossom Trail or continued straight up the rise then turn right and proceed down to a trail that runs between gate (G2) on Little Sunapee Road and gate (G3) on Burnt Hill Road (not blazed but shown in red on the map). The Orange Blossom Trail starts at the Yellow trail, goes uphill to the intersection with the Blue Trail then down to the gate (G2) on Little Sunapee Road. The Yellow Trail is the steepest on the property as shown in the trail profile. It ascends nearly 200 feet in a quarter mile. The Red trail is on the other side of Burnt Hill Road. It provides a pleasant walk in the forest to gate (G4). 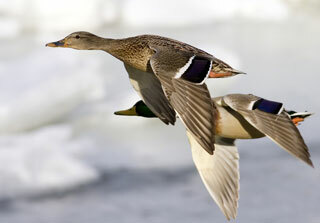 It is on an old logging road that is ideal for cross-county skiing or snow shoeing. The trails are maintained by the New England Forestry Foundation.